Nearly 80 brethren and companions attended the South Fylde Group dinner at St Annes Palace and that was no surprise with the Provincial Grand Master Tony Harrison being in attendance. 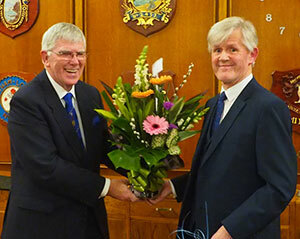 This was a particularly poignant occasion however, as it marked the retirement of group chairman Ian Ward. Tony Harrison (left) receives flowers for his wife Maureen from Ian Ward. The evening began with attendees gathering in the finely decorated ‘Blue Room’ for tea, coffee and biscuits. It was here that members enjoyed the opportunity to meet with Tony in a ‘getting to know you’ environment. Also circulating amongst the members were Assistant Provincial Grand Masters David Winder and David Randerson, Assistant to the Provincial Grand Principals Duncan Smith, the Provincial Grand Wardens John Karran and Barry Dickinson, the Provincial Grand Chaplain Godfrey Hirst, the Provincial Grand Secretary Peter Taylor, the Provincial Grand Director of Ceremonies Keith Kemp with Deputy Director of Ceremonies Jason Dell. 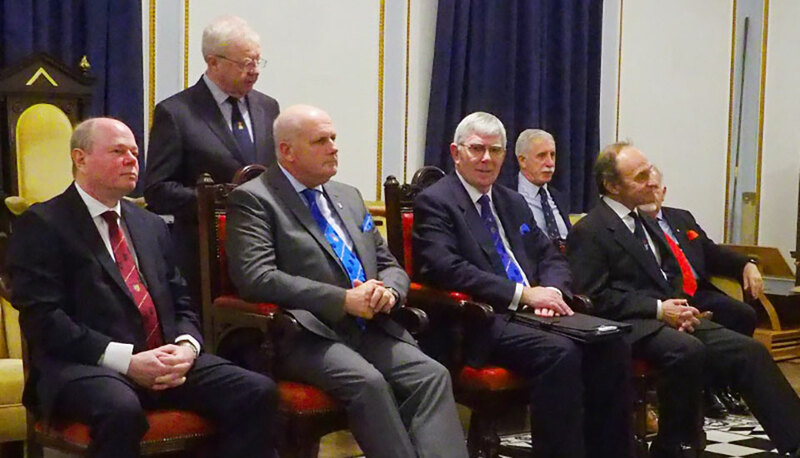 There were several other grand officers headed by Past Assistant Provincial Grand Master Steven Reid, along with several group officers; conversation was lively to say the least. Everyone then moved to the main lodge room for the customary question and answer discussion with Tony Harrison in the chair, where he was supported by David Winder, Duncan Smith and Peter Taylor. A lively debate ensued covering subjects such as the needs and difficulties of communicating through newspapers and other forms of media, attitudes towards privacy and personal liberties, internet platforms such as Solomon, Membership Pathway and Facebook, with many views concerning recruitment and retention and the care of candidates. Some interesting insights were offered from the chair and by speakers alike. John Topping of the Lodge of Triumph No 1061 opened with a question concerning our relationship with the press, stating that he had several links with local journalists through his work. Comments from Godfrey Hirst, David Winder and Ted Rhodes illuminated issues within religious organisations and within the police. In response to an enquiry by David Calvert of Tithebarn Lodge No 8446 regarding the internet platform Solomon, Peter Taylor advised that the majority of those logging into this are from outside the United Kingdom. Questions and comments by Chris Tittley and Geoff Fogden of the Lodge of Fidelity No 1256 were key to the debate on recruitment and retention with the need to interview members who resign from the Order to establish the reasons why people leave, it was stated that many people leave Freemasonry during the first two years of joining. With dinner time looming, Tony Harrison brought the discussion to an end, thanking everyone who had contributed to the debate, many more than can be named in this short account. The next move was towards the bar and the banqueting suite, where a three-course meal had been arranged by group secretary Dave Barr. Following the meal several toasts were observed. That to the health of the Provincial Grand Master was proposed by Chris Thompson, WM of Landmark Lodge No 7273. In his speech Chris spoke of the admiration that everyone in the group and the Province of West Lancashire has for the work that Tony carries out on our behalf. Chris also thanked Tony for finding the time in an already busy diary to come and spend time talking individually to the brethren present. In the foreground, pictured from left to right, are: Harry Davidson, Ken Oxley, Tom Dunne, Keith Jackson, Mike Heed, David Calvert and Grahame Whattam. Having thanked Ian Ward for the invitation to the meeting and Chris Thompson for his toast, Tony continued by thanking all the South Fylde Group officers for the work they do. He went on to thank all the South Fylde brethren who supported him on his visit to the Emulation Lodge of Improvement in London, where he had been extended the honour of being their festival president. In all, over 150 West Lancashire brethren attended, making the biggest festival ever in terms of attendance. Tony continued by thanking Ian Ward for all the work he had carried out during his term of office, a comment that was well applauded by the audience. He then announced that Ian’s successor would be the current group vice chairman, John-Robbie Porter, again to warm applause. Tony also announced that the new vice chairman would be Dave Barr. In his general comments, Tony offered congratulations to all receiving honours at Provincial Grand Lodge, adding that he hoped that many will come and support them on the day. He also offered his best wishes to the many companions who will receive chapter honours in October. 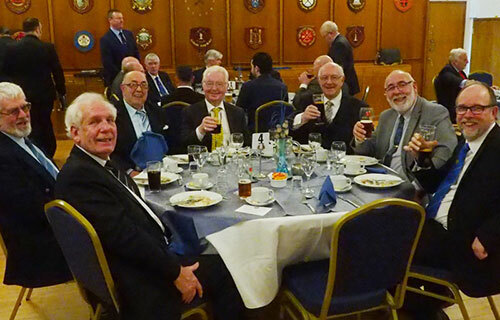 Barry Dickinson followed with a toast to the South Fylde Group in which he congratulated many of its lodges on receiving certificates of Patronage to the MCF 2021 Festival. He also congratulated the members of the Fylde Group Lodge of Instruction on their support of Tony Harrison at the Lodge of Improvement Festival, particularly Arthur Lea, who had taken an active role by delivering one of the lectures to such a high standard. Barry also praised Ian Ward for his hard work as chairman of the group, at the same time acknowledging the support he had received from his group officers. David Winder then rose to make a presentation to Ian Ward. David spoke of the appreciation felt by group members for Ian’s long years of service, which had begun when he was appointed as group secretary in 2005, then vice chairman in 2009, culminating in five and a half years as chairman. David also thanked Ian for always being there when needed and the support and friendship he has always provided. David then presented Ian with a voucher for £250 to spend on the other passion in his life, that of cycling. Also, to Ian’s great surprise, David presented him with a glossy booklet filled with a collection photographs from his life. At the end of the presentation, all present stood to deliver loud and lengthy applause. The event was closed by a presentation of flowers to Tony Harrison for his wife Maureen and then the closing toast by Terry Stevens-Lewing of Fairhaven Lodge No 5076. Pictured from left to right, are: Duncan Smith, Keith Kemp (standing), David Winder, Tony Harrison John Karran, Peter Taylor and (half hidden) Barry Dickinson.